Forecasters who are interested in adding even more dimension to their formulas may see good results by incorporating contact rate into their armory of forecast methods. 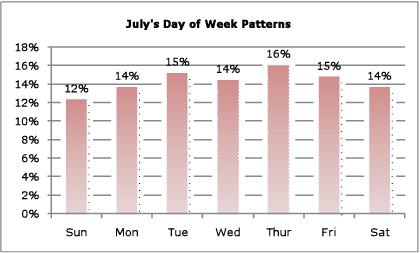 The most common interpretation of contact rate gauges time-of-day, day-of-week and month-of-year distributions, but you can also use contact rate to measure how, when, and why your customers reach you. It can become a very important part of your long-term forecasts, especially if you take the time to study each element individually. 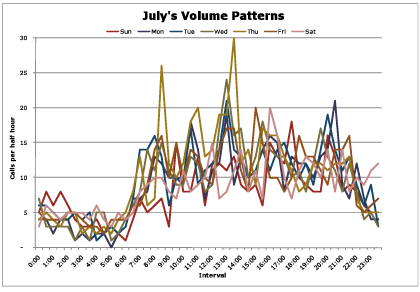 Drilling your history down into seasonal, daily, and interval levels is a necessary practice if you are trying to schedule properly. If your heaviest volumes arrive on Monday afternoons, it can pay off to avoid having meetings during that span of time. An accurately modeled report shows you where those peaks will happen, and it’s data that you may need to look at in different ways. Learn about how your customers prefer to reach you. 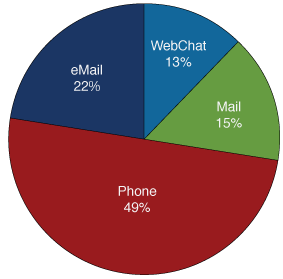 The modern term “Contact Center” replaced “Call Center” in the ‘90s when email opened a new avenue to get to an agent. But even in the ‘80s, customers still had snail mail and sometimes used faxes in addition to standard phone calls. Collect data on any method that leads to workload, even those that do not require Erlang staff inflations. Another step for analysis is evaluating why customers are contacting you. First call resolution is the purest data to assign directly to contact rate. If a customer has to call a second time about the same problem, contact rate begins to increase. If a customer calls, abandons due to long wait times, then places a second call, contact rate begins to increase. This can be unavoidable in your contact center, so it’s best to choose a range of time that represents the purest environment before drawing your final correlations. It identifies if certain changes in your call center are driven together or separately from a change in your customer base. This is good information for you to know because it can help you become better prepared when similar changes are repeated in the future. Example: The Marketing department sends a mailing inviting members to join at a discounted rate. This increases volumes to activate membership, and also increases total customer base. Both changes occur simultaneously. It identifies the changes to your contact rates that are causal vs. changes that are benign. This will come in handy when you know a change is coming and you’re trying to determine what to expect based on the impact of similar changes in the past. Example: The Finance department has decided to increase the fees for the service being offered. This creates additional volumes, and also loses some customers who are unwilling to pay the higher fees. The result is a new contact ratio with no historical precedent. It can be overlaid on top of longer-term forecasts. Any additional efforts you can make to fine-tune a long-term forecast will pay off, especially because these forecasts are, by nature, a lot more art than science. After you’ve identified a pure data group, find out how big your customer base is. Make sure this report defines your customer base accurately. For commercial customers it should make a clear distinction between companies vs. employees, and for consumer customers between households vs. “bellybuttons” (number of people living at a single residence.) If you have a customer that is really a single company with 500 employees (potential for 500 calls), that will generate more workload than five companies with ten employees would (potential for 50 calls). Once you have your pure data set and your customer base, you can start drawing preliminary correlations. This is a simple process of dividing the number of contacts you receive by the number of customers you have, and then repeating that until you see consistent results. In the example above, it’s easy to see the relationship between the contacts received and the customer base. Each household averages 1.82 potential adult callers, and that translates into approximately 2.5 consistent calls per household each month. Your results may not be this clean in the beginning. 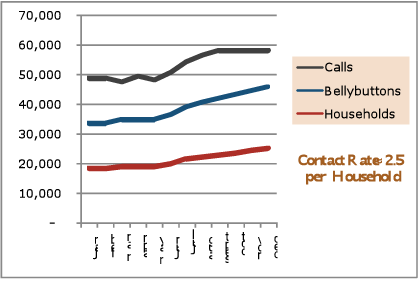 Pure Calls, used above, represent single, first call resolution contacts per household, so I calculated contact rate on households instead of bellybuttons. Also, if the number of dependents has an impact on the number of calls, you will also need to track your average dependent ratio on a recurring basis. Since Pure Calls was already a cleaned number, it was easy to calculate the contact ratio at the monthly level. When you initially start calculating this, you may need to use quarterly metrics instead of monthly. I wait until I’ve seen at least four consistent data points before using the results from the contact rate calculation. Even with consistent results, it should still be used as an overlay to your existing forecast – not as a complete replacement. One exception to this rule is in a brand new call center that does not yet have enough credible historical data. Existing centers that are forming brand new service offerings would also apply. In these cases, you can actually use contact rate as a nice substitution for time-series forecasting until you can collect enough data to let you migrate to the time-series method instead. And once you have enough historical data, the two methods can be merged together, giving you a boost in your forecast performance with that extra tweaking. Tiffany LaReau is the Workforce Manager and Owner of Human Numbers, an outsourced forecasting and scheduling service provider. She can be reached at Tiffany@HumanNumbers.com or 678.494.1506 .